Opinions about whether the United States has a responsibility to accept refugees – which were already deeply polarized – have grown even more so, according to a Pew Research Center survey conducted in April and May. The survey comes as the nation is likely to admit its smallest number of refugees in decades. Roughly half of Americans (51%) say the U.S. has a responsibility to accept refugees into the country, while 43% say it does not, the national survey found. That is changed only slightly from February of last year. However, Republicans have become less likely to say the U.S. has a responsibility to accept refugees. Today, about a quarter of Republicans and Republican-leaning independents (26%) say the nation has a responsibility to accept refugees into the country, down from 35% in February 2017, a few weeks after President Donald Trump took office. 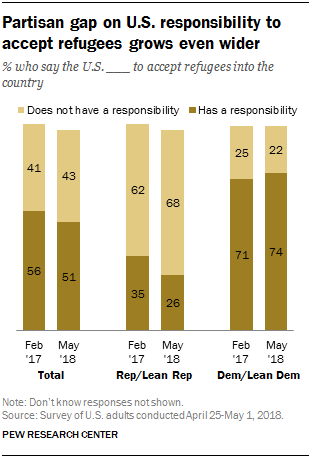 Opinion among Democrats and Democratic leaners has changed little over this period: Currently, 74% say the U.S. has a responsibility to accept refugees, about three times the share of Republicans saying this. The recent shift among Republicans has been driven by conservatives. In 2017, a third of conservative Republicans said the U.S. has a responsibility to accept refugees. But today, an even smaller share (19%) says this. There has been less change among moderate and liberal Republicans: Currently, 40% say the U.S. has a responsibility to accept refugees. As was the case last year, liberal Democrats (85%) are more likely than conservative and moderate Democrats (65%) to say the U.S. has a responsibility to accept refugees. 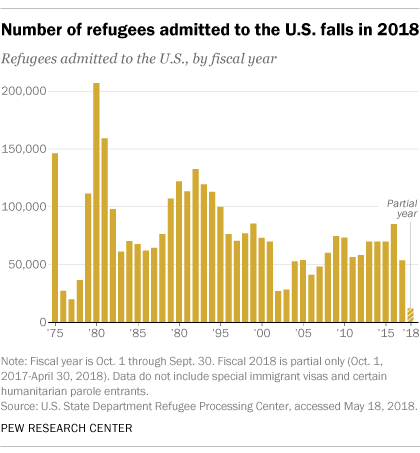 Earlier this year, a Pew Research Center analysis of State Department data found a sharp decline in the number of refugees who have entered the U.S. so far in fiscal year 2018 compared with prior years. This is partly due to an admissions cap the Trump administration placed on refugee resettlements, which now limits the number who may enter the U.S. to 45,000, the smallest total since Congress created the current refugee program in 1980. Partisanship and ideology are major factors in opinion about whether the U.S. has a responsibility to accept refugees. Yet there also are differences by race, age, education and religion. Among the public overall, whites are considerably less likely than blacks and Hispanics to say the U.S. has a responsibility to accept refugees. Younger adults, women and those with higher levels of educational attainment are also more likely to say the U.S. has a responsibility to accept them. By more than two-to-one (68% to 25%), white evangelical Protestants say the U.S. does not have a responsibility to accept refugees. Other religious groups are more likely to say the U.S. does have this responsibility. And opinions among religiously unaffiliated adults are nearly the reverse of those of white evangelical Protestants: 65% say the U.S. has a responsibility to accept refugees into the country, while just 31% say it does not.